It’s time for another inauguration of another theme, Sporting Thursday. Having an active lifestyle has always been important to me, it’s only natural I should continue that through my photography. For todays first post of Sporting Thursday, we travel to the Carlson Center, Fairbanks, Alaska, for the first round of the soon-to-be defunct Central Collegiate Hockey Association, where the Michigan State Spartans traveled to play the University of Alaska Fairbanks Nanooks. Friday, March 8, was a intense, low scoring game. Despite the Nanooks 35-15 shot on goal advantage, 3 minutes into overtime, MSU’s Matt DeBlouw slipped the puck past Nanook goaltender John Keeney. The image I have of DeBlouw’s game-winning goal is an interesting thought experiment. Occasionally the discussion of sport-journalists acting as cheerleaders arises. In this particular instance I had positioned myself in hopes UAF scored the overtime goal, a better angle then if MSU did. As we know MSU scored first, had I kept a neutral position it’s likely I would have a cleaner image with the puck easier to see. Of course, sports are unpredictable, and would-be images frequently happen out of range or obstructed. This cheerleading mentality can also manifest in war reporters. Stories get edited, or completely untold, to protect the reputation of the military. That is not something I have experienced, and a discussion for another post. UAF goalie John Keeney realizes the game is over after MSU scores in overtime. The Nanooks won Saturday, I game I did not attend, 4-1, forcing a deciding game three on Sunday. I showed up sometime in the second period, the score tied 1-1. Within five minutes MSU went up 3-1, both goals I may have got a good shot of, if I had been ready. Also within that five minutes two players broke some glass, causing over 20 minutes in delay. MSU then went up 4-1, and the game ended 4-3, with UAF being done for the season. UAF goalie John Keeney hangs his head after MSU scores their 4th, and ultimately game-winning goal. Broken glass created a lengthy game delay in the second period. ‘Tis the season to ski: Nat’ Geo’ Extreme Photo of the Week and more. First things first: A huge shout out to my friend and fellow (former) Fairbanks resident, Luke Smith, who is the skier in this weeks National Geographic Extreme Photo of the Week. Photographer Ryan Kruger captured Luke skiing Frazier Basin, Bridger Range, Montana. Here’s the image, click the link above to see the full story. I especially like the delay between the initial viewing and noticing the skier, and of course, the monochromatic image. Photographing skiing and snowboarding is a very delicate balance for me. Often my love for snowboarding overpowers my desire to take photos on the hill. It’s easy to worry about my camera, ducking under and squeezing through trees at Skiland, where I ride, and the fartherst north chairlift in North America. I am becomming more comfortable with it though. The hardest part is forcing myself to be less agressive while riding. While neither of my photos offer the extreme enviornment of Krueger’s, they have their own qualities. Both with a strong sense of light, the Sun peeking out behind my friends Nils and Nick in the first, illuminated hoar frost on the lift in the second. The first image is also a pan shot, my movement, parallel with the subjects, keeps them in focus while blurring the background. Nick and Nils gather speed for the traverse at Mt. Aurora Skiland. Hoar frost and an Alyeska sticker on a chilly, early morning chairlift ride. Sometimes I put my foot in my mouth. Photographic tastes are fickle, and after saying film is a major part of my aesthetic I decide to go more digital. There are many reasons, but I’m not trying to get too personal in this blog. One of the primary reasons: film’s magic for me is black and white. The film is cheaper and I can process it myself. But sometimes I just want to see the world in color. Another reason: to make steady money with photography while possible shooting film, one need’s a very well established name. The final reason is, in all fairness, probably the most important, ISO. Also known as ASA or simply film speed, it is a rating of sensitivity to light. Digital cameras can shoot at such high ISOs (6,400 and above) film cant hold a grain to it. So I splurged, bought my first unused camera, but thanks to a combination of reward points the bill was cut more then fifty percent. Here are two pictures from my first few rounds of shooting. Patrick left and David right, Granite Tors east of Fairbanks. 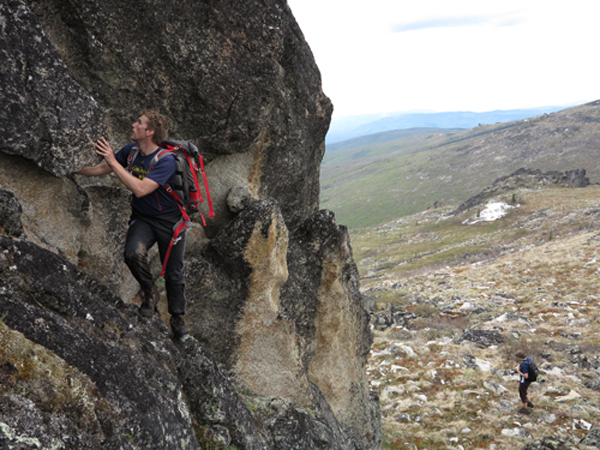 The picture above was taken at Granite Tors, a popular climbing destination and fifteen mile hike outside of Fairbanks. What I like about this picture is scale. The far horizon is balanced by the climber in the foreground. Then after viewing the second hiker a sense of elevation is really present. 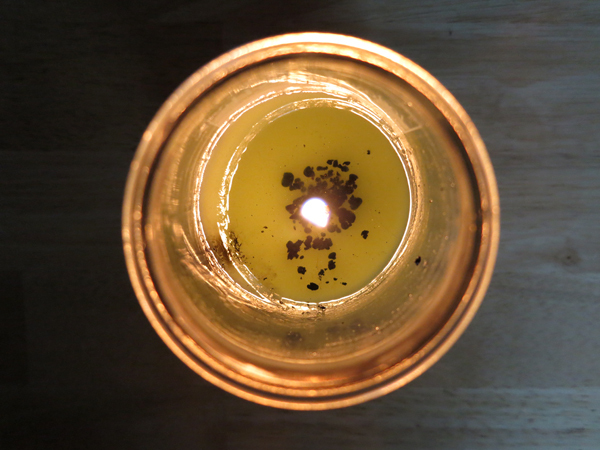 A candle burns during a rain storm. Humans see in color, and despite my love for black and white color makes, or breaks, many photos. In this image the strong monochrome and repetitive circles ground the viewer, while the abstract composition makes them wonder if they’re looking at a celestial formation. The Quest is off an running. 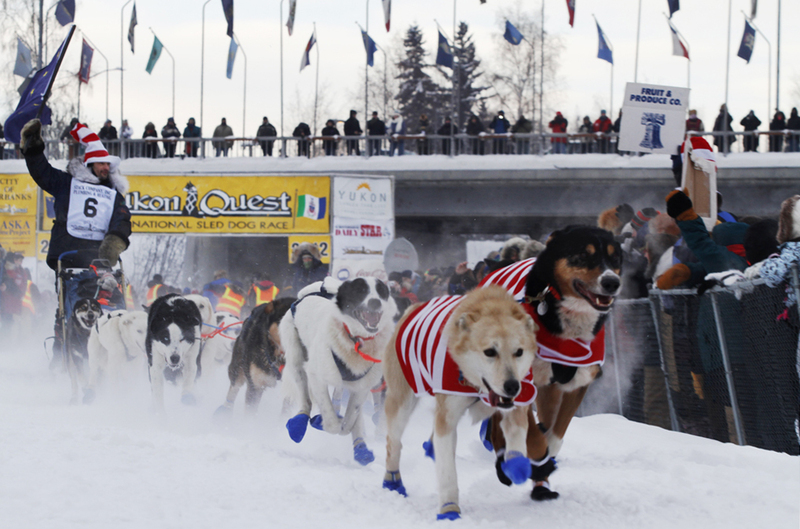 Each year the start alternates between Fairbanks and Whitehorse, this year it was in Fairbanks. Sadly, due to a very amateur mistake while I was attempting to shoot film at the start I only have a few digital files to work with. Thankfully it’s easy to shoot a lot of digital pictures very quickly, so I got some frames to work with. There’s lots of places to follow the Quest, my Extreme Alaska class is running a storify feed. 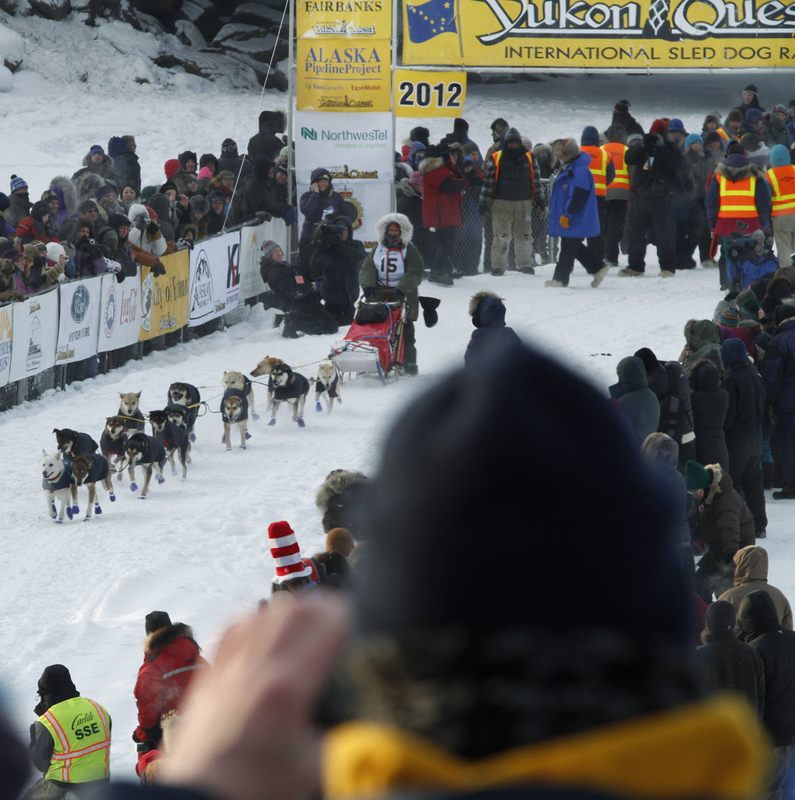 Marcelle Fressineau, a rookie from Whitehorse, Yukon in Canada comes out of the gate during the 2012 Yukon Quest. Hugh Neff of Tok, Alaska, shoots out of the starting gate waving an Alaskan Flag on the Chena River during the 2012 Yukon Quest.